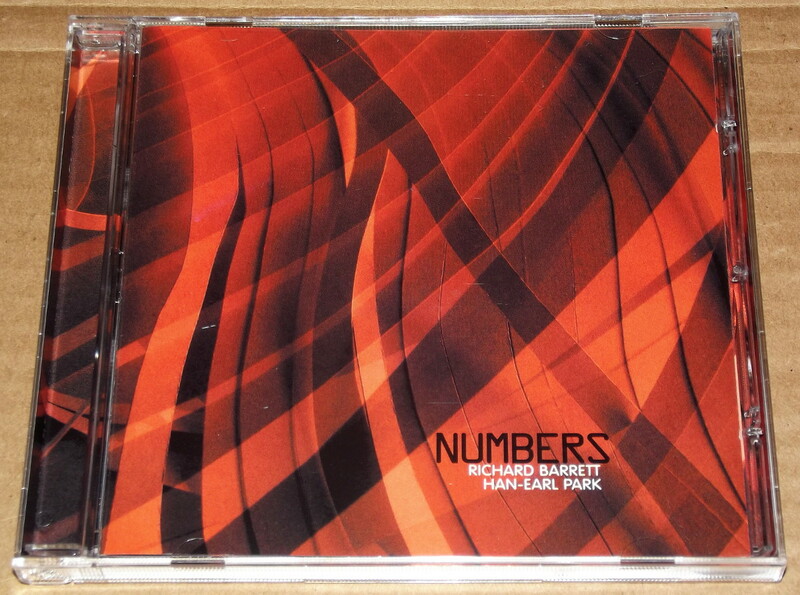 On Numbers (CREATIVE SOURCES RECORDINGS CS 201 CD) we have the team-up of the guitarist Han-Earl Park with Richard Barrett playing live electronics. After some 20 minutes of slotting this one into the old playback vestibule, I bethought me “Yikes…amplified Derek Bailey meets Thomas Lehn!” Park is one of those scary polymath guys who seems to have a tremendous facility for music, both improvising and composing it, and he has played in many groups and at many festivals, appearing around the globe in seemingly ubiquitous fashion. Scariest of all is his intense and speedy guitar technique, which on parts of this album presents a rush of tangled information that would require a bank of dedicated computers to solve it. Thankfully Mr Han-Earl is never too “glib” in his phrasing and throws in multiple fishhooks and other barbs to snag our ears, otherwise we might be tempted to switch off in the face of his effortless glides and spiky dense riffs. It’s also good to find him in this duo set-up where the detail of his playing can be more clearly heard than in Mathilde 253. The Englishman Barrett is also a composer, like Park sometimes situated in an academic and teaching context, and is no stranger to using electronics in the live situation having formed the FURT duo with Paul Obermayer as long ago as 1986. Some day I really must get around to hearing FURT, or some of Barrett’s compositions, because I have the sense I would find a denseness and complexity that I could really sink my teeth into. Barrett’s method in wielding his “boxes” here is certainly pretty enervated. Regardless of whatever intricate and dazzling shapes are thrown at him like crystal spears by his sparring partner, he responds in kind with impossibly twisted gurgles, shrieks and salivated electronic utterances. Throughout album, a lively and sizzling session of fierce interplay is staged between these two boxing kangaroos, with sqwawks and yelps a-plenty as another blow is landed on the respective muzzle or snout. The striking thing is that neither player appears to be breaking into a sweat at any time, and I have the abiding mental image of two unfazed chess players sitting in a deep-freeze unit, weaving complex theorems while remaining almost immobile in large leather armchairs. The music has that degree of rigid control, of brittle precision, even when the structure appears at its maddest and the musical data is flying wildly beyond the point of interpretation. The value of this music as a form of invented language is emphasised by the odd titles, ‘tolur’, ‘tricav’, ‘ankpla’, ‘uettet’…as if counting upwards in Venusian. From 19 June 2012. We got a small bundle of items from the Lisca Records label in Lucca on 25 June 2012, which I intend to digest one at a time. First from the envelope is Uncodified with the Document (LISCA 011) album, which is mostly the work of Corrado Altieri, although the venerable Simon Balestrazzi popped into the studio to add electronic parts to a couple of tracks, and also did the mastering using his magickal digital toasting device. Unlike Balestrazzi who seeks to beguile with occult drones, Corrado Altieri is a no-nonsense bare knuckle fighter, and can be quite adept at piling it on with remorseless intensity when creating nasty slabs of throbbing noise-poundage. ‘Severance’ is one particularly compelling assault of post-industrial grindery which is akin to trip through the ancient tunnels of Lucca at high speed during a dark night, while also being pummelled about the face with a leather sap. ‘Aesthetic Imperfection’ is slightly less brutal, but still exhibits the same qualities of airless, layered, noise; the ultra-dense sound occupies every available space in the spectrum and never dares to relax its tinnitus-inducing whirrs and buzzes. And for those who still enjoy inculcating a sense of dread and unease in their lives through music, the opening cut ‘Discobar Panic Disorder’ is your go-to point for the requisite ingestion of paranoia. Just ten seconds in and an instant migraine headache will be thine. I think it achieves this through its upsetting mixed organ chords, but there is also an overhanging cloud of gloomery on this cut produced by more insidious and inscrutable methods. Maybe all it takes is to go into the studio when you’re in a bad mood, and your ill temper will simply pass directly into the recording process. Of the other cuts, five of them are extremely short, making cryptical and punchy statements in a matter of seconds; perhaps they were rescued from offcuts or outtakes of longer sessions. One of them may be simply an amplifier warming up, another a mere doodle from a synth machine. I wish other noise-makers could be as concise and selective in their releases. Document is perhaps not a staggeringly innovative release in this genre, but there is much strong content to enjoy in this stern frowner of sullen, rhythmic, pulsations. Slow minimalist composition from Monty Adkins on Four Shibusa (AUDIOBULB RECORDS AB040), which was released in April 2012. Each lengthy title uses the plaintive long tones of the twin clarinets played by Heather Roche and Jonathan Sage, and combines this sound with wispy electronic drone music, holding everything for a long time. Along with duration, delicacy and subtlety are the main watchwords, but Adkins is carefully creating some very poignant contrasts in his music – it’s just that they happen very slowly and tend to creep up on the listener. The term “shibusa” is Japanese and is concerned with finding beauty in everyday objects, recognising perfection in simplicity. As part of his aesthetic development along this contemplative road, Adkins worked for one year with the visual artist Pip Dickens, whose paintings of small and beautiful objects can be seen on the panels of this digipak. I like parts of this record and perhaps my preference is for the unadorned clarinets, which have a stark loneliness I find appealing. The electronic half of the act is a shade too “tasteful” for me, but I admit the combination of sounds works well.